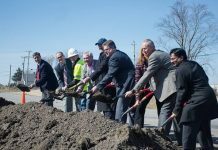 Work has started on an $18 million mixed-use development at the International Marketplace in Indianapolis. The project, Hanna International Lofts will be constructed in two phases and will feature residential and commercial space, according to a report in Inside Indiana Business. The first phase of the development will include a new complex building that will have 26,000 sq. ft. of commercial space. Construction is expected to be completed in the first quarter of 2019. The second phase will include 65 residential units that will be added to the remaining land. Most of the units will be available for rent but some will be for sale. Construction on that phase is expected to be completed in August 2019. The project is expected to create 225 construction jobs and 125 permanent jobs.